The museum is located near the junction of US Highway 64 and Tennessee Highway 68, on the site of the old Burra Burra Mine overlooking the town of Ducktown. The address is 212 Burra Burra Street. 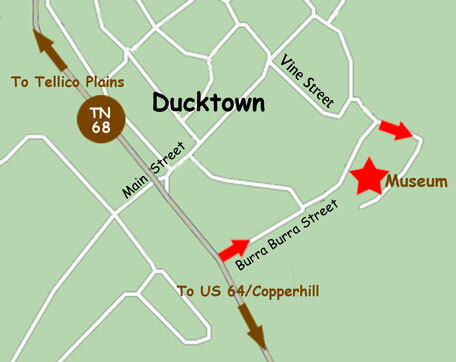 If you're coming from Ducktown, the turn from TN 68 onto Burra Burra Street will be on your left, just past the ETC building. If you're coming from Copperhill, or from the TN 68 exit on US 64, the turn will be on your right. The copper smelting and refining process consumed enormous amounts of wood and charcoal. Between 1865 and 1878, an estimated 47 square miles of land in the vicinity of the mines was stripped of its merchantable timber.